Having a haphazard bill organizing system or worse, no bill organizing system, can cost you dearly. I know from experience! Years ago before I got my finances (and life) in order, I relied solely on my memory for paying bills. I figured I’d remember the due dates and amounts I was supposed to pay. A budget was non-existent. I didn’t realize how much a bill payment organizer could have helped me. My memory failed me because I never wrote anything down. I’d add the bill to my bill basket and that was the extent of my system. It wasn’t until I received a credit card bill saying that I’d missed two payments and if I didn’t pay by the specific date that my interest rate was going up. Yikes. That was my wake up call. I realized I needed to get organized or my finances and credit would suffer. That was many years ago and I’ve turned everything around. Now I never miss a payment and my finances are organized. John calls me the bill paying machine and let’s me handle all our household finances. One of the first things I did was write everything down in one spot. Today, I have a couple free bill organizing printables to help you get your t’s crossed and i’s dotted, so to speak! Having a system in place will save your sanity. Sure, you can keep it all in your head, but the chances of you forgetting something is high. Write it down and ensure you don’t ever miss an important payment. Your credit rating will thank you for it. 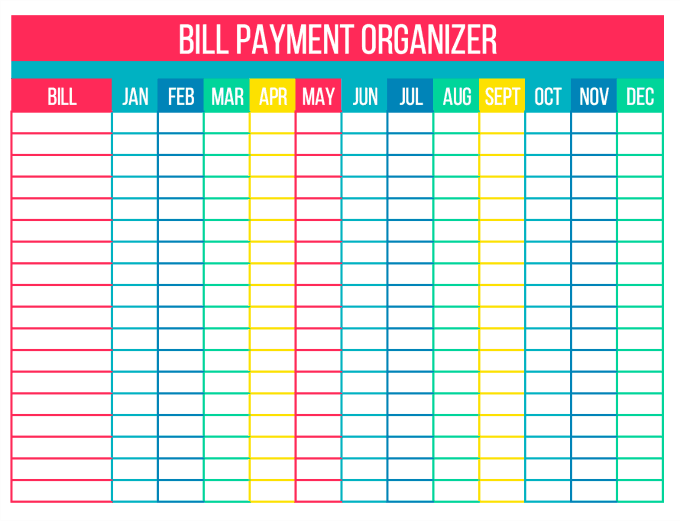 The first printable is a Bill Payment Organizer. You can list out your monthly bills for the year and put in the amounts in the appropriate column. At one glance you can see all the payments that are coming due. After you pay them, cross them off with an x. This organizer is great for those regular bills we all get like our power, phone, cable and heating. You know they are coming each month. It will also keep you aware if somehow you don’t get a bill in the mail (or email). Companies will still want their money so using the fact the bill never arrived isn’t an excuse. Stay on top of things and always know what is ahead. I like having all the key info about my bills in one spot. This Household Bill Organizer is a summary of all your bills including account info, phone number and more. This way, if you need to call to inquire about a bill you have the info readily available and don’t have to dig around for your account number and their phone number in your filing cabinet. This bill payment organizer has saved me countless times! 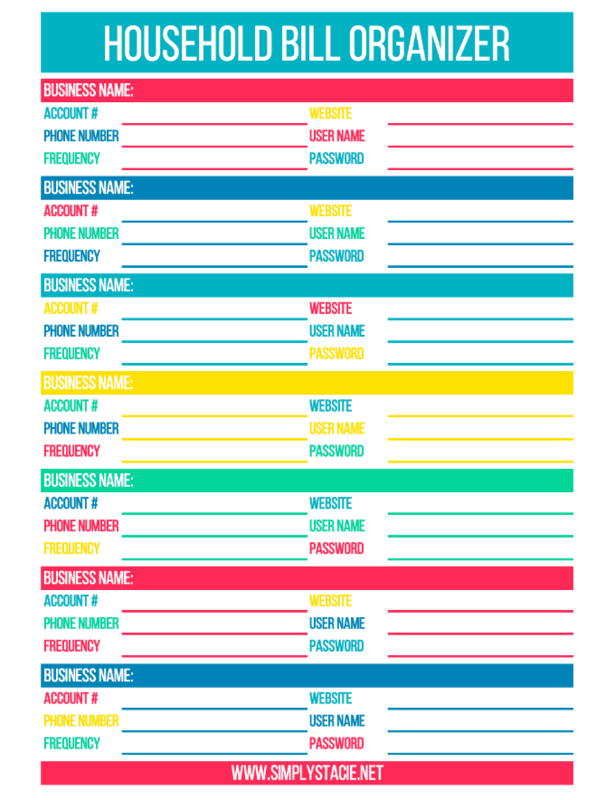 For instance, when the power goes out, I don’t have to dig and find our last electricity bill because I can just look at this set of printables to find the right phone number to call. Keep your old bills, but you don’t have to leave the hanging around your kitchen collecting clutter. I also have a free 2016 Financial Planning set of printables too if you want to check those out. I’m always putting out new printables so make sure you subscribe on the form below so you don’t miss them! 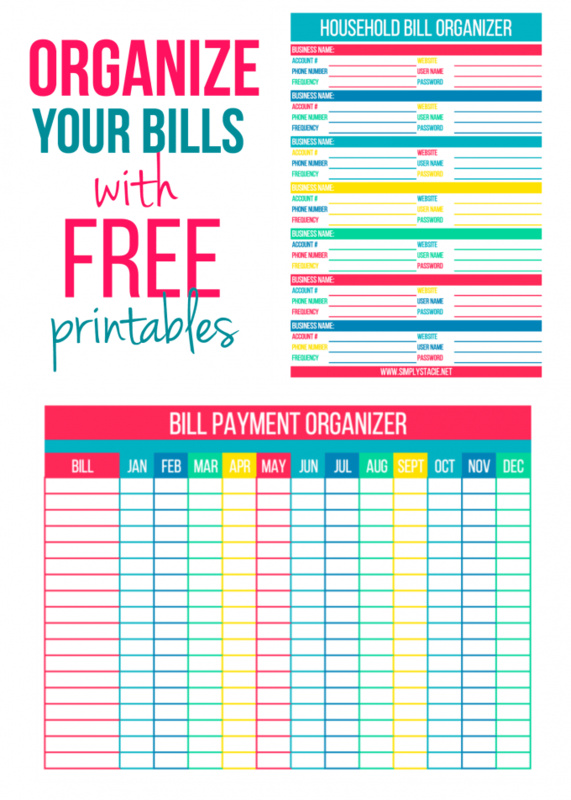 How do you keep your bills organized? Looks like a decent way to help set up and manage your bills. May have to give it a try. This is great! Right now, we have reminders that go off on our computer to pay bills. Looks like a great way to keep up on your bills. Can I fill this out on my computer and save it or do I just have to print it out? These ones are printables to print off and fill out. You could make something similar on the computer though using a spreadsheet program like Excel. This couldn’t come at a better time. I’m just starting to take over the household bills from my husband who has the start of Alzheimer’s and I didn’t know where to start. It’s almost as if you knew. This is a great start. And but rhe way, you look so much like Sally Fields. I hope that made your day as you made mine. You have a very Happy New Year. This is really awesome! I’m going to start using this immediately!